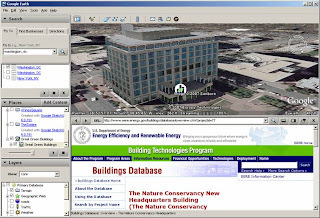 Google has partnered with BuildingGreen.com and the Department of Energy to allow you to view full SketchUp models on Google Earth of the 96 projects in Building Green's High Performance Buildings Database. Here's an example I pulled from the D.C. area - the Nature Conservancy Headquarters by HOK. Will SketchUp 6.0 become the new Computer Aided Design (CAD) for developers, designers and builders? Is there a benefit to starting design directly on a (virtual) site? I mean, will architects, builders and clients have a better understanding of environmental context given tools like these? Can we employ more complex modeling techniques (wind, solar, energy, water, etc.) given the resources and reach of our friends at Google? 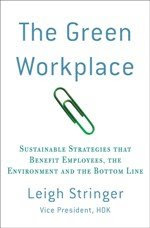 Will doing "all of the above" create better buildings for people, profit and the planet? The EPA is now using Google to find out about the air quality in any neighborhood. The tool tracks the worst air polluters! One of the greatest advantages I've found to designing "on site" with SketchUp is the ability to quickly assess the impact of my designs on the surroundings (or vice versa). It's an efficient reality check even when we're well within proscribed setbacks, daylight planes, etc.